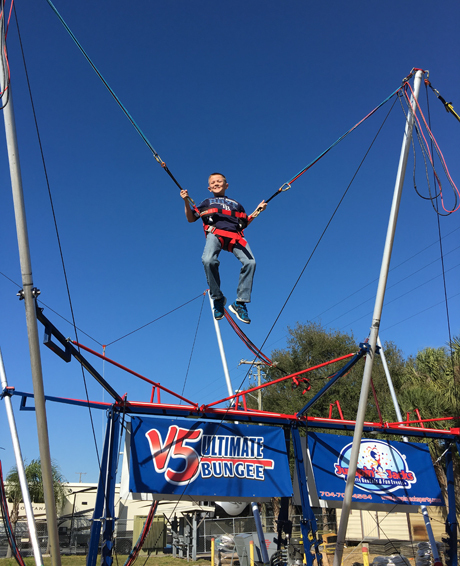 Our highly acclaimed Ultimate Bungee trampoline now has 5 stations! FAST & EASY SETUP Anyone who has assembled a traditional bungee trampoline understands the serious time commitment and effort required for setup. The V5 Ultimate Bungee directly addresses that problem, and sets up in under 20 minutes with 2 employees. A 12 volt hydraulic lift system effortlessly raises the single-piece aluminum poles. A unique bracing bar latches around the upper poles to provide support. There are no guy cables or turnbuckles! If time is money, then the V5 Ultimate Bungee is sure to keep more in your pocket by saving on setup and staffing costs. AUTOMATED OPERATION A traditional bungee jump unit requires one operator per jumper to control an electric winch. The V5 Ultimate Bungee simplifies operation and cuts staffing requirements in half by utilizing a proprietary Auto Bungee™. This hydraulic device automatically pulls the bungee cords higher with each jump. When the jumper is ready to come down the operator simply flips a switch to lower them. The V5 allows 2-3 operators to safely monitor 5 jumpers. CLASSIC BOUNCE Nothing beats the jumping experience that real bungee cords and trampolines produce! Countless alternatives have been tested, but everyone comes back to this gold standard. We use 3 bungee sizes to ensure each jumper gets the perfect bounce for their weight. Sealed air, 10′ diameter bongos give them the added bounce that they need. QUALITY COMPONENTS Our V5 Ultimate Bungee is equipped with the very best components. Every harness, carabineer, bungee, pulley, and jump pod has been carefully selected to ensure that this is the ultimate jumping experience. Enjoy increased capacity, faster setup times, reduced staffing costs, and a safer jumping with the V5 Ultimate Bungee!